Hey guys, sorry for not getting a good post up today but I sorta had a busy day - swatching, cleaning, dyeing my cousins hair, etc. So I wasn't going to post today, I figured I would leave my giveaway as my most recent post for today. But then I got a comment from a follower, kathhxo, asking if Milani 3D Digital was similar to OPI's Teenage Dream. This photo is really big so please enlarge it for detail! Three coats of each. I never thought about this comparison before, but they are similar. Digital is a bit brighter pink, and has an overall holographic effect, while Teenage Dream has larger holographic glitter. From a distance, without flash or sunlight, they look pretty similar, but in the light you can really see the difference between the overall holo and just the holo glitter. Thanks for this suggestion, kathhxo! If any of you would like a comparison of something, I'd be happy to do it for you. Check out my stash page for my collection. New glitters from OPI for the holidays. Give them to me now. I wish they were coming out sooner though! I don't want to have to wait until October or November! OMG I have to do another Muppet mani for these! Why can't the holidays be here already?! 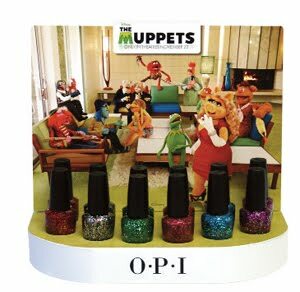 i need all of those muppet polishes, holy crap!